In a major update to its privacy policies, Facebook(s fb) on Thursday announced a series of measures that will help its more than 1 billion members from “over-sharing” — such as posting personal information to the general public, or telling friends about every single song they hear. And, in a major policy pivot, Facebook will change the default settings for new users from “Public” to “Friends only,” a move that will spare new users from having to navigate Facebook’s often-byzantine privacy menus. Taken together, the changes have big implications for Facebook’s advertising business since it will reduce the overall audience of Facebook posts. The changes also come on the heels of other recent pro-privacy initiatives by Facebook, such as permitting users to log-in anonymously and new restrictions on third party apps’ ability to garner data about users. All of this suggests that Facebook is finally changing the cavalier attitude it has traditionally taken towards privacy. But why? On one hand, Facebook may simply be responding to users’ desires for more control over information. At the same time, however, the new policies may be a shrewd way to get out front of regulators in the U.S. and, especially, in Europe, where online privacy is an ongoing issue. The changes also come at a time when privacy advocates are scrutinizing the implications of Facebook’s acquisition of social media services like Instagram and WhatsApp, which will give Facebook access to new data for hundreds of millions of people. Facebook’s new policies may also have the effect of forcing other major tech companies like Google and LinkedIn to re-evaluate how they handle privacy settings. Every time we like a post that is shared with “Public”, our whole friends list can see that we did. This is annoying. Definitely, one post could have more likes if we could keep it private from our friends (if we wish so). The point here is not to hide the “like” whatsoever, but give us the option to choose if we don’t want that our “like” be immediately shared with our other friends (as “John liked Mary’s post”) who do not have nothing to do with that post or friend. 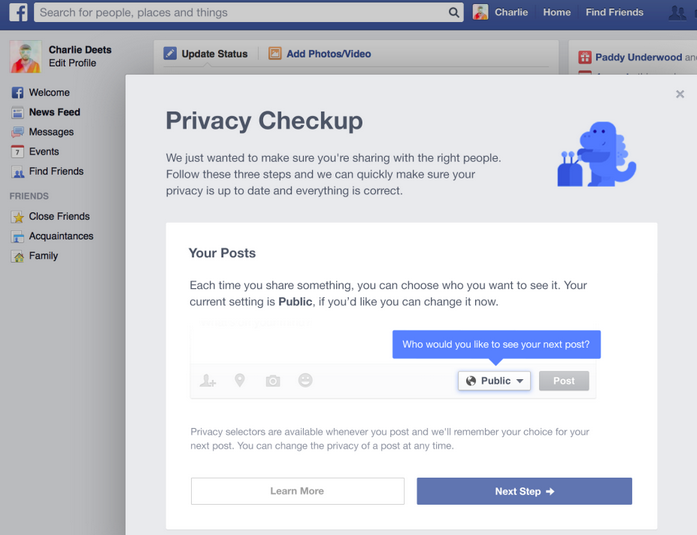 Facebook should give us the freedom to choose each step we do in the website, otherwise will be each time more affected by privacy issues.